Mayan civilisation was centred around Mayan cities which were independent entities located in different parts of Mesoamerica. These cities were typically located on trade routes so that they could earn from the trade on these routes. Alternatively, they were situated on lands which could give ample agricultural produce. Each city had a King of its own whose palace was at the centre of the city. In the time period of 1000 to 500 BC, Mayan villages were becoming increasingly populated and turning into towns and cities. These early cities had causeways and architectural buildings. From 400 BC to 250 AD, many major Mayan cities came to prominence. These included El Mirador, one of the earliest capital cities in the Mayan civilisation and home to grand architecture, the city of Tikal and the city of Kaminalijuyu among others. El Mirador was a huge city that became the centre of Mayan civilisation from 3rd century BC to 1st century AD. During its prominence, the city had a population of more than 100,000 and hosted many architectural wonders of the era, including huge temples such as the La Danta, which is considered one of the largest pyramids in the world. Another notable architectural features of the city were the causeways linking it with other cities of the era. Tikal was one of the most powerful and influential cities of the Mayan civilisation between 200 and 900 AD. 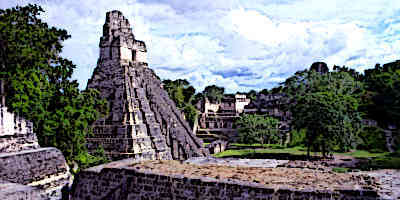 During this period, Tikal was able to dominate the political and economic life of the Mayan region. At its peak, the city had an estimated population of 120,000. One of the most remarkable things about Tikal is its dynastic line which successfully ruled the city for 800 years. Calakmul was one of the most ancient cities of Mayan civilisation which rose to power and prominence in the Mayan region and became contemporaneous with Tikal and El Miradore. The city is also termed as “Kingdom of the Snake” in the historical records and had a snake as part of its emblem. The total population of the Calakmul kingdom is estimated to be 1.75 million which included the 50,000 inhabitants of the Calakmul city itself. 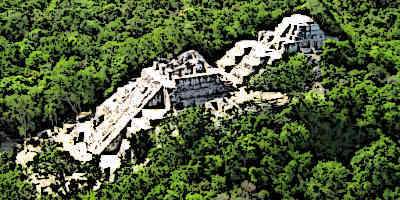 Calakmul is notable for being home to one of the largest pyramids of Mayan civilisation, rising up to 148 feet. Uxmal was a Mayan city that rose to prominence in the 9th century. It was one of the most powerful cities in the western Yucatan and contained many notable architectural structures. Among its most iconic structure is the “Pyramid of the Magician” which was built with the unusual oval outer layers which was in contrast with the then-traditional rectilinear outer layers of pyramids in the Mayan cities. Nunnery Quadrangle is another notable Uxmal structure which is a long building with carved facades all over it. Like many other Mayan cities, Uxmal also had a ballcourt. It lost its significance after 1000 A.D. although it was still inhabited at the time of Spanish invasion. 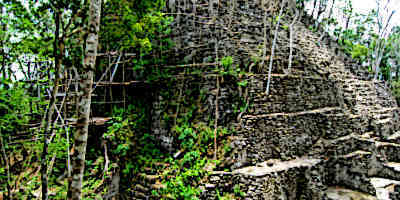 Coba was a city of nearly 50,000 inhabitants at the peak of its civilisation which came about between 500 and 900 A.D. It was the key Mayan powerhouse in the Yucatan area between 200 and 600 A.D., controlling vast areas of land, water bodies and trade routes. It lost much of its power and influence to Chichen Itza and was confined to a humbler city-state by 1000 A.D, although it continued to be inhabited until the Spanish conquest. Caracol was a large Mayan city located in a region of modern-day Belize. Caracol rose into prominence between 250 and 550 A.D., forging trade ties with other city-states in the Mayan region. The city had a population of over 100,000 at its peak. In the 6th century, Caracol defeated the declining might of Tikal and the following period lead to the rapid growth of Caracol and an increase in its prosperity. Copan was a Mayan city located in what is modern-day Honduras. During the Classic Period, Copan was the capital city of a major Mayan kingdom and had an estimated population of up to 25000 at its peak. By the time of the Spanish invasion in 16th century, the city had been abandoned. 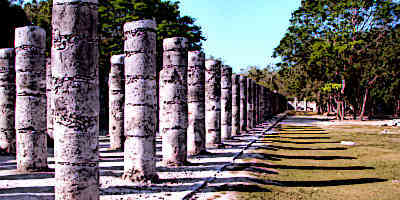 Chichen Itza was one of the major cities of the Mayan civilisation in the Late Classic period. It housed a diverse population and with its blend of various cultural influences, it created a diverse and advanced architecture. 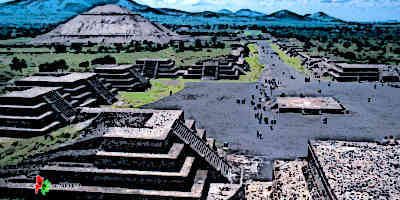 The major architectural monuments of the city included El Castillo which was a large step pyramid rising to a height of 30 meters, a Great Ball Court which was the largest and most well-constructed ball court of the Mesoamerican cities, a huge skull platform similar to those found in Tenochtitlan and a massive Temple of the Warriors which was a large stepped pyramid with long rows of columns carved in the imitation of the warriors. Chichen Itza rose to influence and power during the 10th century and dominated the northern Maya lowlands. It saw its decline in the 13th century. Most Mayan cities were ruled by the King who hailed from notable dynasties. Every Mayan city had many notable architectural structures, most common being temples made in the shape of stepped pyramids. The cities were often connected with each other through limestone causeways which helped establish trade routes and links between them. Most cities had significant populations, some like Tikal and Caracol home to more than 100,000 inhabitants. Mayan cities evolved from smaller towns and villages in Mesoamerica which had started coming into being by 1000 B.C. By 500 B.C. many Mayan cities had come into being and some of these cities became the centres of different Mayan kingdoms. Among the most notable Mayan cities were El Mirador, Tikal, Caracol and later, Chichen Itza. Few of these Mayan cities exist today and most of them had much influence or power in the region when the Spaniards invaded Mesoamerica in the 16th century. In recent centuries, the cities have been rediscovered and their marvellous architecture has been examined and studied extensively.